…and it was perfectly appropriate. Disney cast members are highly trained in many ways. 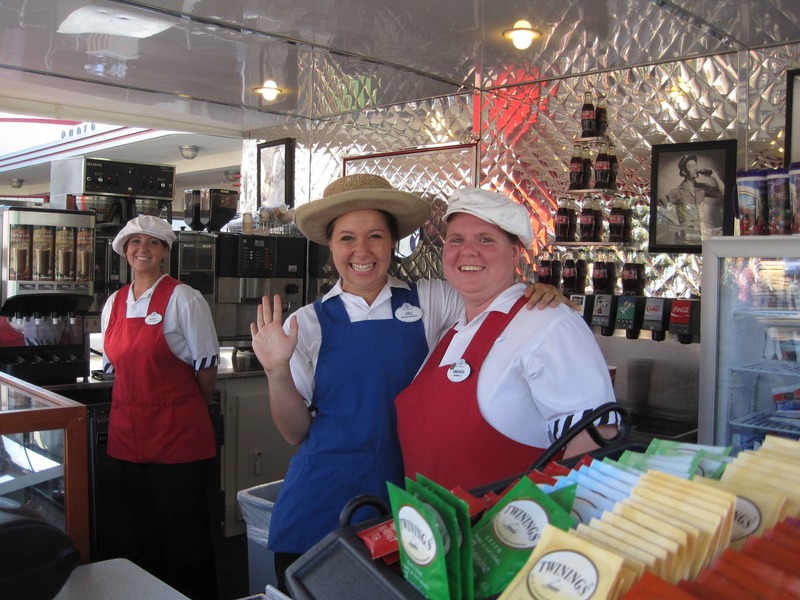 You likely know of their magical customer service and commitment to staying in character, and making sure the parks run smoothly, but the order in which those commitments play out is not at all random. But they will let efficiency slide to keep the “show” intact – to stay in character. If you eat at the 50s Prime Time Cafe, part of the show is that they bring you nothing unless you say please. For everything. I asked for “diet Coke, and water, please” and she brought me water. “Still waiting for that Diet Coke” I said a few times, until I realized that I had never paired “Diet Coke” with “please.” Once I did, there it was. Our server came around and hovered a lot to give me the opportunity — totally inefficient, but part of the show. And my daughter loved it. And have you read this post? And the show will slide for the sake of efficiency. The cast at The Haunted Mansion is glum and stern, and a bit creepy. The ride itself isn’t that scary, and when a small child started crying in line, a cast member broke character, took the child aside, sat on the curb with her, and explained – you may even say spoiled – every single effect and visual of the attraction. Smiled and encouraged and patiently explained. Courtesy trumps show. If you’ve heard me talk about giving up Role power for Relationship power, you know that Role power is absolutely required when safety is in jeopardy. And when that’s the only time it’s invoked, it’s pretty powerful. Another thing that’s powerful? A clear priority of what you need to be most mindful of in any situation. Watch for Safety, Courtesy, Show, and Efficiency as you go about your day; or execute your own work. See how that works out. Q: When can you criticize freely? It’s so hard to turn off Disney work mode when I’m done too. I work parade audience control, and I always find myself telling people to stop playing with the ducks or get off the railings or trashcans or starting conversations with random people about where there from, etc (not a bad habit). They definitely drill it into your consciousness.